Randall DeWitt is the author of an upcoming flash-fiction collection, Blunt Flash Trauma, which will also include stories by Sharon Daynard, Ruth M. McCarty, and Kathy Chencharik. He is a three-time winner of AHMM’s Mysterious Photograph contest; one of these winning stories, “The Cable Job,” went on to win the 2012 Derringer Award for Best Flash Story. Here he talks about the experience of writing flash fiction and entering the contest. When the latest edition of Alfred Hitchcock Mystery Magazine arrives, the first thing I do is turn to “The Story that Won” to see who authored the prevailing 250-words for the latest Mysterious Photograph contest. I read the story, and then scan the honorable mentions for names that I know. I remember what it was like to see my name on that list and the feeling of accomplishment when the winning story was mine. If my stories and name can appear on that page, anyone with a fertile imagination and half-decent writing skills can too. As a past winner of the contest, I have a secret I’d like to share with you—I don’t consider myself a writer. I base this conclusion on years of marriage to a mystery writer who is much more talented and by having read the stories of many of her friends in the writing community. I get jealous just thinking about how they can masterfully fill page after page describing something as simple as a sneeze if they wanted to. Me? My version would read Achoo! and that would pretty much be it. But in the world of flash fiction, my shortcoming might be my biggest asset. I don’t have to tamp down the urge to paint a Rembrandt to illustrate my story because I don’t possess that kind of a brush. Low word counts are my friend. And if the result is a picture worthy of hanging in Boston’s Museum of Bad Art, and people want to look at it, I’ve done my job. I’m happy. Everything begins with the Mysterious Photograph itself of course and the search for an answer to why? Why is this picture integral to the story? I try not to overthink it. If there’s a title to the picture, I consider those words too just like everyone else. And there it is, the phrase that probably dooms most submissions—like everyone else. Not every story has to end in a gruesome murder. I’ve written dark submissions but in my experience it’s the light-hearted ones I’ve sent in that have won. So sometimes I concoct new ways to attempt, pull off or stop a robbery. Other times I test the judges with a caper that borders on the absurd. Whatever I come up with, it has to be out of the ordinary. That doesn’t mean I don’t try to incorporate something that everyone may relate to. I think that sort of connection with the reader helps sell the story. In my winning entries, one had a familiar tempting smell. In another, it was dealing with the cable company. In my last, it was the annoying habits of a co-worker. Finally, I’m sure it doesn’t have to be said but the ending has to be satisfying. I often prefer to add a small twist as long as it plays fair with the reader and makes sense. If it’s written well enough, who knows? Award-winning short-story writer Robert Lopresti has been writing fiction for almost 40 years. He is the author of Greenfellas and, recently, the nonfiction When Women Didn’t Count: The Chronic Mismeasure and Marginalization of American Women in Federal Statistics, among other books. Here he talks about his story “The Chair Thief” from the November/December issue and the role of titles in fiction. The latest story in that series, by the way, is about a snowfall heavy enough to cancel school and it will appear as “A Bad Day For Algebra Tests,” unless editor Linda Landrigan changes the title. Which editors have a right to do, of course. And I have the experience to prove it. Back in the 1980s a title popped into my head: “My Life as A Ghost.” Alfred Hitchcock’s Mystery Magazine bought the resulting story—my first sale there, hurray!—but changed the title to “The Dear Departed.” What can I say? I liked mine better. Maybe I’ll use it again sometime. One day I was driving along listening to Bob Dylan’s song “Mr. Tambourine Man,” and I noticed his line about the streets being “too dead for dreaming.” I almost drove right off the road. What a title for a mystery novel! Too Dead For Dreaming. So I wrote one, set in Greenwich Village during the great folk music scare of 1963. Unfortunately Dylan’s company wouldn’t give me the rights to use that line as a title, so I switched to Such a Killing Crime, which comes from a song that was out of copyright long before Bob was born. With my second novel the choice was easier. A comic crime novel about mobsters trying to save the environment? It had to be Greenfellas. Sometimes you can outsmart yourself. I published a story in The Strand about a woman buying a gift for her son, but the story was really about her obsession with the past and her hopes for the future. I called the story “The Present” but I doubt if anyone got the double meaning. Except me, of course. I thought it was brilliant. And sometimes the problem with a title is not what it means, but the way it sounds. If it is a long phrase, you really want it to scan. I wrote a story about the race riots of 1967 and my original title was “Bullets in the Firehouse Door.” That captured what I wanted to say but it felt long and awkward. I came up with “Shooting at the Firemen,” and was very pleased with myself, but two early readers told me to drop the word “the.” Maybe it depends on whether you pronounce “fire” with one syllable or two? In any case the story appeared in AHMM with the shorter moniker. 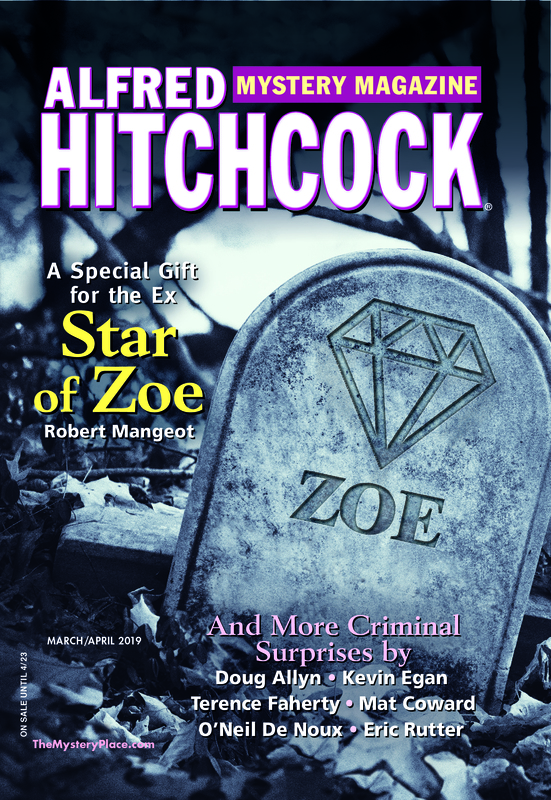 I am delighted to report that I will have a story in the next issue of Alfred Hitchcock’s Mystery Magazine too. The title I used was “Train Tracks,” but I wasn’t thrilled with it and invited Linda to improve it. She looked at the first sentence: “The best day of my life started when I got arrested,” and suggested using the first six words as a title. I thought it was an improvement but, after much debate, we wound up back on the train tracks (which sounds dangerous). Maybe when you read it you can offer us an improvement. Just for fun, here are some of my favorite titles of mystery novels. You can add your picks in the comments. Both my sons, Travis and Jeff, pitched their way up from Little League diamonds to college baseball scholarships. Jeff had the added good fortune of being picked in the 20th round of the 2001 Major League draft but “retired” from pro baseball in 2008 after two decades of involvement in the sport—a time span associated with career servicemen and police officers, not a 26-year-old. High-level competition put a lot of wear and tear on those bodies—in Jeff’s case necessitating Tommy John surgery and several knee and shoulder operations. Along with the physical damage came extreme frustration as each setback seemed to occur when he was about to break through to the next level. Recovering from these repeated injuries required a work ethic, mental toughness, and level of patience that he did not inherit from me. Although my wife and I shared plenty of excitement with him, we were also privy to the long stretches of painful rehab. Those are among the closely personal makings of the story. Meanwhile, there is a funny amateur indie out there that was put together a dozen years ago by a trio of Jeff’s Stockton teammates. Dream Revolver, the creation of Ben Winslow, Eddie Cornejo, and Jed Morris (they lend their names to some of the fictional teams in the imaginary Pacific Valley League), began as a day-in-the-life video spoof. Hours of footage later, the project had snowballed (not the most apt metaphor for the San Joaquin Valley) into a surrealistic feature in which every member of the team got to appear on screen and which may very well have been key in reversing what began as a lackluster season. I recall briefly contemplating a novelization of the film, but found myself too busy trying to sell shorter fiction to well-known mystery magazines. The makings, however, kept simmering on the back burner, until three years ago when I resolved to revive the “dream” in the guise of a crime story and pitched it (no pun intended) to Jeff to get his help in developing background and motivation. As we went back and forth, I aimed for exposition-lite while slipping in as much detail about minor league life as the story’s confines allowed. I think most of it was relevant, the rest revelatory. And since I was fashioning a crime story, I had to juxtapose the exhilaration of playing and contending at that level with other less positive issues that open the door to corruption and violence. Firstly, there are so many empty hours to fill “at home” and during the long and uncomfortable “away” trips on cramped buses and in distant motels—the proverbial idle hands. Players have to contend with a guaranteed half-year’s separation from family and friends, not to mention the pressures, demands, uncertainties, and illusive lucre of a sport in which only a small fraction make it to the Show, and not all of them under innocent circumstances. For many players, only the supporting fabric of their communal living keeps their careers above water, no matter what their talent. So what happens if they don’t fit in? On the brighter side, the Stockton Ports roster for 2005 lists the names of more than a dozen players who eventually stepped onto major league ball fields. Perhaps the movie magic had something to do with that high success rate. Eddie and Jed remain active in baseball as successful college coaches, Benny is still making action-filled films of men in uniform (Navy and Marine Corps), and Jeff has become part of another special team, albeit law enforcement—which just goes to show how persistent some dreams can be. Jeff Cohen is the author of the Aaron Tucker series, the Asperger’s Mystery series (as coauthored by E.J. Copperman), and three other series under the Copperman byline. He also pens the Double Feature series about Elliot Freed, to which his tale in the current AHMM belongs. Here, he talks about how that story came to be. I’d written three novels featuring Elliot Freed, a one-time novelist who was now running a one-screen movie theater that he dubbed Comedy Tonight. Elliot showed only comedies; one classic, one contemporary every night. But Elliot’s run had ended (the publisher’s decision) and he’d gone into retirement in my head. Except that he didn’t. I kept thinking about the character years after the last book (A Night at the Operation) was published. How had he coped with his sort-of newfound financial security? How was he getting along with Sharon, his ex-wife, who was now carrying his child? That was the thing—the baby. Readers would send emails asking about the baby. Was it a boy or a girl? (I’d always answer, “yes.”) Did Elliot and Sharon remarry? (I thought I’d made that one clear in the last book—no.) Was that all there was to say about the gang at Comedy Tonight? Enough questions and enough random thoughts in my head led to my AHMM story, “It’s A Mad, Mad, Mad, Mad Girl!” I wanted to revisit Elliot and his entourage (his parents, his theater staff, Sharon) and see how they were doing. I wanted to answer the question and most of all I wanted to write in Elliot’s voice again. Elliot is my favorite of my characters (sorry, Alison, Samuel, Kay, Rachel and others; I love you too) because he’s a comic hero—he fights back with humor. Writing for him is like writing for Groucho Marx. I wanted to see if I could get back in that groove. Whether or not I did is up to you. But I’m pretty happy with where things ended up. Maybe in a few years I’ll miss Elliot enough again. Jeff Cohen is the author of the Aaron Tucker and Double Feature (Elliot Freed) mysteries and co-author with E.J. Copperman of the Asperger’s Mystery series. As Copperman, he writes the Haunted Guesthouse, Mysterious Detective and Agent to the Paws series. That sounds like a lot of work. He may have to lie down now.